Adobe Lightroom Classic and Lightroom CC (Cloud-based version) were released to customers on 12 February 2019. The headline new feature in these updates was ‘Enhance Details’ , which is a brand new approach to demosaicing raw photos. It can be found in Adobe Camera Raw, Lightroom Classic CC, and Lightroom CC for Mac and Windows. Adobe claim that with Enhance Details algorithm you can increase the resolution of both Bayer and X-Trans based photos by up to 30%. Enhance Details works on any raw file apart from files converted to a linear raw file, HDR or Panorama merged files. While applicable to any raw file format, Fujifilm X-Trans based cameras benefit most from applying Enhance Details. Adobe have prepared a white paper, which can be found here and if you’d like to try Enhance Details on a Fujifilm X-Trans based file, you can download one here, which I used for below example. I used this image because disappointingly I could find no image within my own library that demonstrated the improvements that Enhanced Details is capable of delivering. I suspect many Lightroom users will be equally disappointed. The Enhance Details option can be accessed by Right clicking (Control + clicking) on a selection (single or batch) in Library/Develop Loupe, Grid, or Film Strip andselecting “Enhance Details” from the context menu. “Enhance Details” will create a new DNG file next to the original file on disk and the file name will be appended with “-enhanced” for identification. The resulting DNG contains both the mosaic data and the enhanced RGB data. 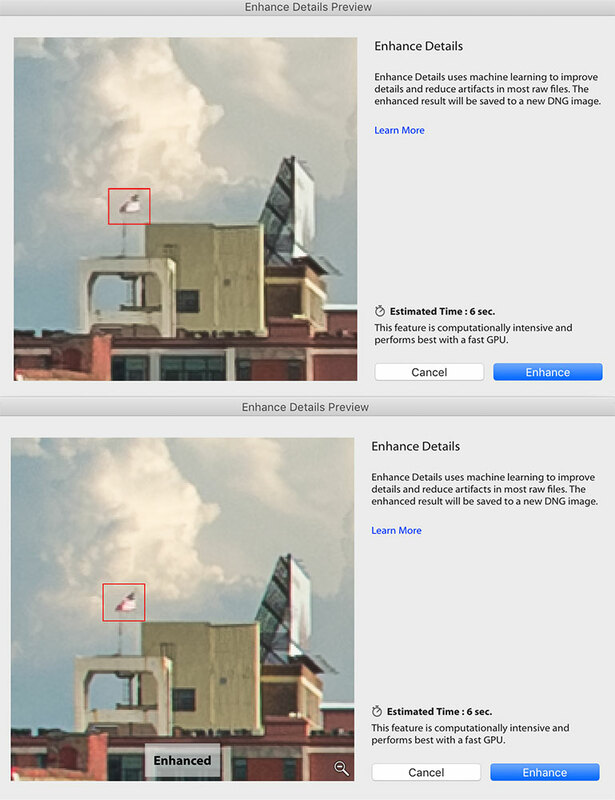 The new enhance image will carry all the metadata and develop settings as that of the original image. Upon ‘Enhance details’ selection from the context menu, when a single image is selected, a Preview dialog box will be shown. A preview of the image(zoomed) will be displayed with enhance details applied. One can long press to view the image without enhance details applied. One can zoom in/out the image in the preview dialog box. If image is zoomed into an area and one launches “Enhance Details” previewdialog, zoomed area will be shown in the preview dialog considering it as area of interest. When more than 1 images are selected, Lightroom Classic would directly start the DNG creation process. Enhance Details option is available in Photo menu for Library and Develop panel. Enhance Details requires macOS 10.13 (or later) or, Windows 10 (Oct 2018 Release – i.e 1809). Enhanced Details is computationally intensive and may take a bit time to run for each image. It performs best with a fast GPU. Enhanced Details can be applied to most raw file formats but not to JPEGs, TIFFs, HEICs or De- mosaiced images. Lightroom Classic also includes an update to tethering, whcih now allows Nikon cameras to utilise the improvements made available for Canon cameras in the October 2018 update. All of the application within the Lightroom ecosystem have also been updated to support new cameras and lenses. This entry was posted in Enhanced Details, Lightroom Classic, Tethering for Nikon Cameras. Bookmark the permalink.